The alarm clock rang and the cats hit the ceiling. 3:45 in the morning. After two years of talking about this mesocosm experiment, finding money for this mesocosm experiment, convincing about 15 other people to join in this experiment, and ordering 48 shipping boxes worth of supplies for this mesocosm experiment (and cleaning it, etc and so forth) and shoving it into 48 shipping boxes (OK, ordering, cleaning, ad shipping was mostly Morgan and Briva), it was time to finally go. I was a zombie and the cats were distressed. When I got to our local airport at 4:58, they weren't even open yet. That happened at 5:00. No sign of the others. I checked in and checked in my bags and paid for the extra bag full of 400 squeaky clean 40-ml glass vials for the dissolved organic carbon (DOC) samples. By then, Manon, Briva, and Morgane had arrived, dropped off by Morgane's tall, young and good natured looking husband. Les filles all looked like a couple of cups of coffee would not go amiss. By 8:00 we were in Paris, and by 12:00, the airport in Amsterdam, which was, wow, a great place to go shopping, if that was your sort of thing. I got a 16 GB SD card for the lab camera and a spare book, since I was already about to finish the first of two I'd brought along. The flight to Trondheim was extraordinary. My nose was, regretably in a book for most of the way (The Monkey Wrench Gang. Awesome! Why hasn't that been made into a movie? It'd be great!). By the time I looked out the window, we were flying over a striated glacial landscape.... bald grey rocks, caps of snow, and trees, trees, trees, tress. And no people. Could we really still be in Europe? We landed sometime after 4 pm and by some miracle, all the bags arrived (intact even). 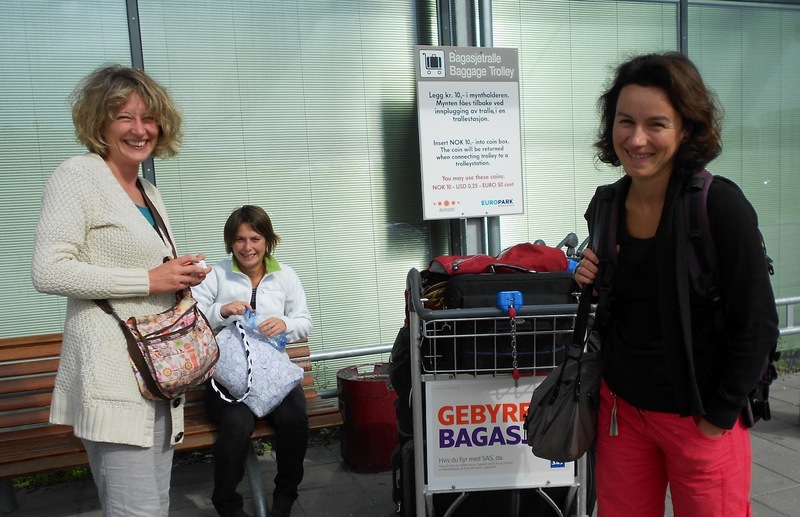 July 30 2012a- Briva, Manon, some of our luggage, and Morgane just after our arrival in Tronheim. July 30 2012b- The view that greets you as you walk out of the international terminal at the airport in Trondheim. We stuck around until Richard and Sari arrived from Southampton about an hour later. 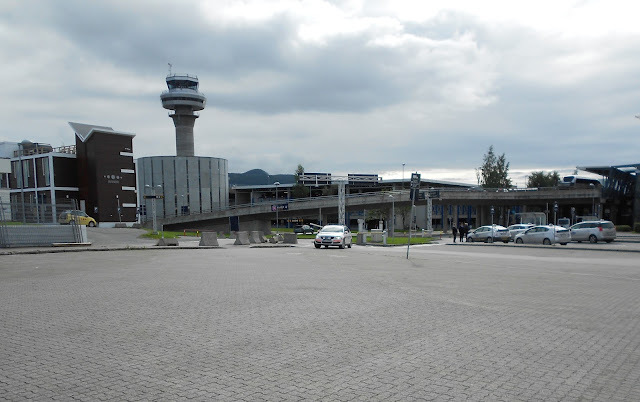 Then after a heart gulping moment when I hoped I wasn't making a serious mistake withdrawing 2400 Norwegian kroner from a cash machine, we bought bus tickets from a friendly bus driver, shoved our mountain of gear in the belly of the bus, and motored off to the main bus station. There we were picked up by our man in Trondheim, Jussi, who already had our engineer Rudolph and our zooplankton woman Juli in his safe care. From there it was an hour and a half along the Tronheimsfjord out to the sea and the Bay of Hopavagen. Luckily, I had Richard by my side in the minivan for conversational entertainment, as conversationally entertaining he absolutely is. And when we arrived (it's out bay! it's our bay! we gushed, recognizing it, like a movie star, from the photos on the web), we had the pleasure of not just being greeted by a dinner warm and waiting, but by Herwig, Mia, and Thomas, the crack Munich team of mesocosm experts. The maniacs had driven for 26 straight hours and had somehow suffered no fatal fights over the car stereo. The food was good, the field station was found to be charming, and the beds were soft and warm. All in all, a good day 1 was had by all.